Sometimes you just need good old comfort food, and this vegetarian spaghetti is one of my favorites. 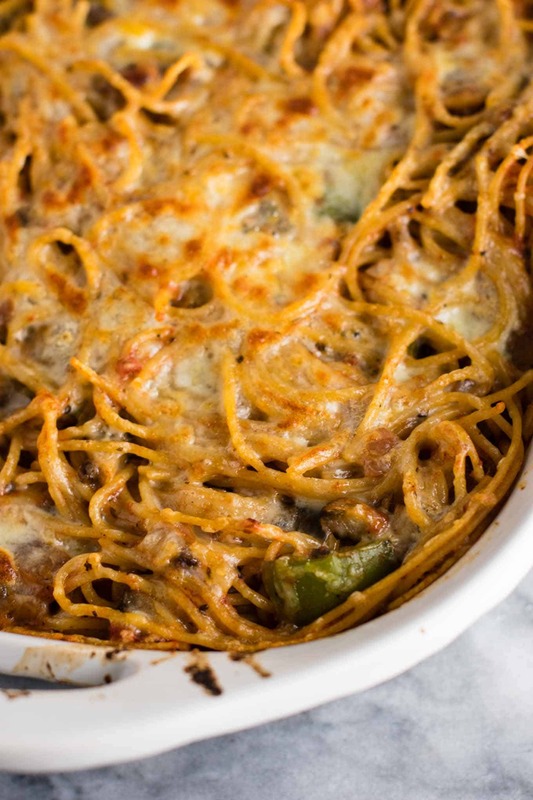 Baked spaghetti is the perfect comfort food! I like to make comfort food a bit healthier, while still giving me all of the warm cozy flavors that I crave. 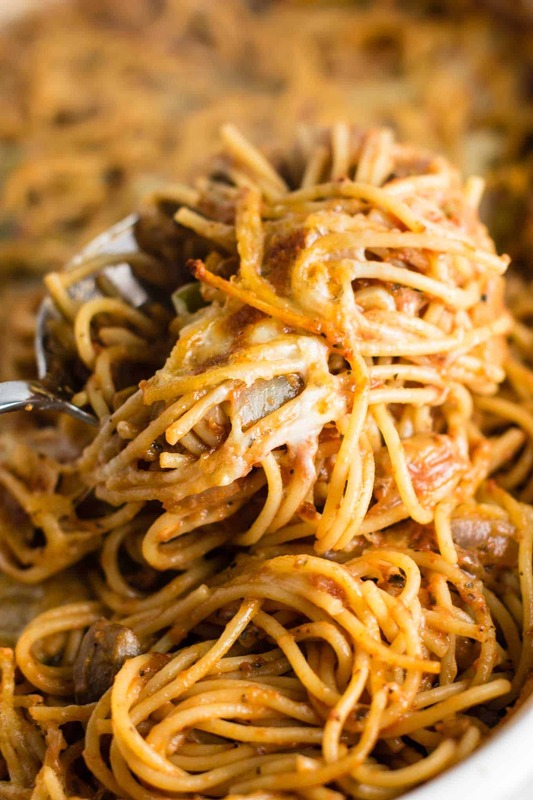 Spaghetti is one of my go-to comfort foods. We have it pretty often, and love that it makes a ton of food. This meal makes 6 servings total! As a kid I’m not sure I was crazy about leftovers, but as an adult I love them! Less cooking for me. Any night that we are eating leftovers is a good night for me! 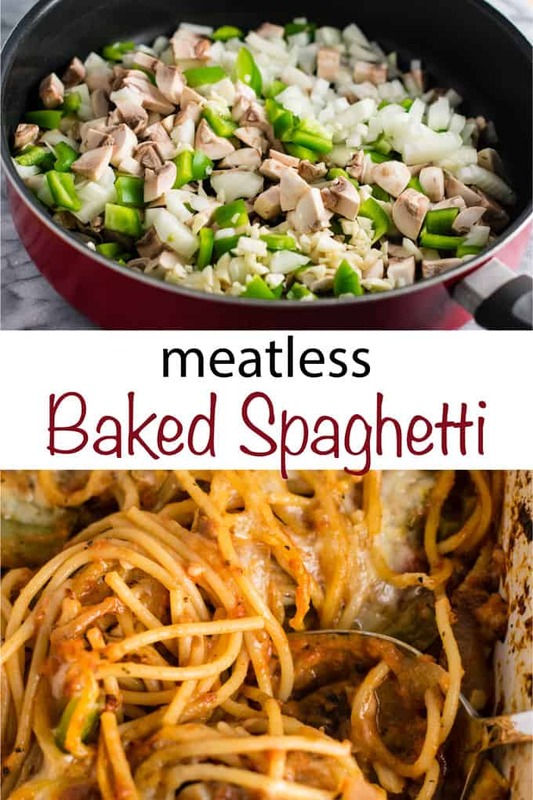 Veggies are key for making meatless spaghetti. I personally love mushrooms every time I make a meatless spaghetti sauce, as they have great texture and are really satisfying. For this recipe I also used bell peppers, onions, and fresh garlic. 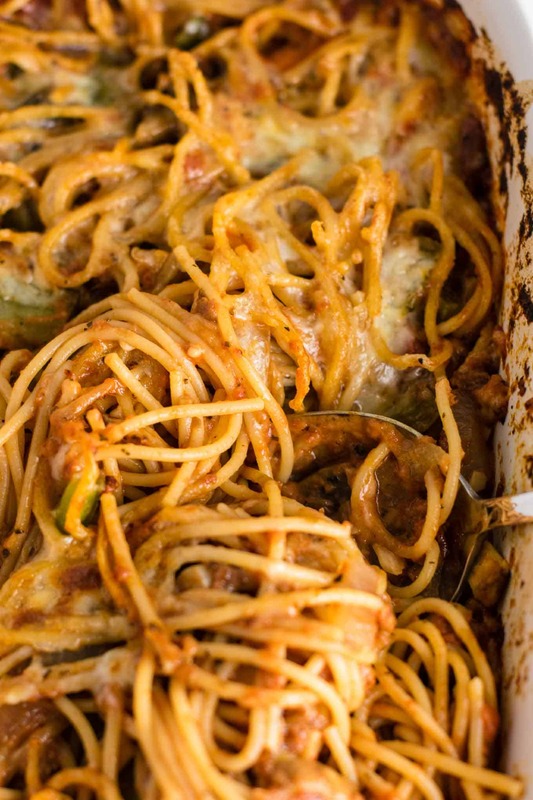 I love making my baked spaghetti a bit more wholesome by using whole wheat spaghetti noodles. You don’t taste the difference, and they are more nutritious than white pasta noodles. Lastly, for big flavor, we are using freshly grated parmesan cheese. Grate it yourself and it has so much flavor! I also use shredded mozzarella cheese which pairs perfectly with the parmesan. 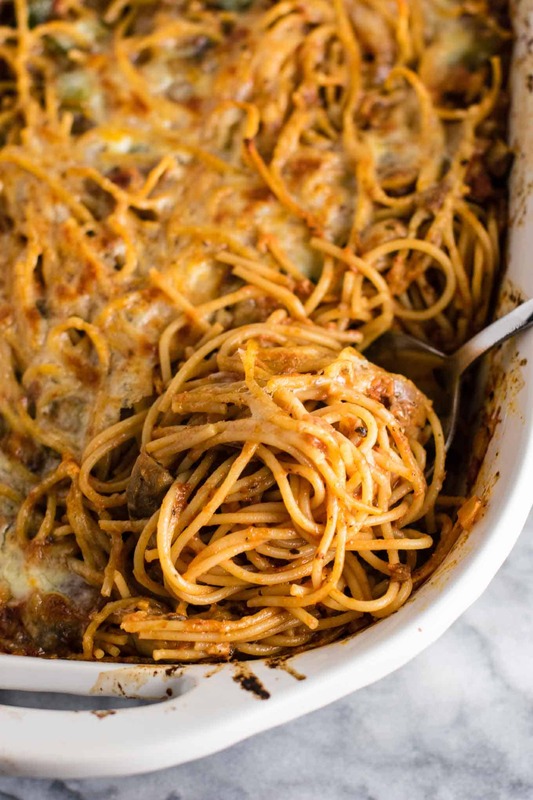 This spaghetti is hearty and filling with bites of warm melty cheese. It’s what pasta lovers’ dreams are made of! 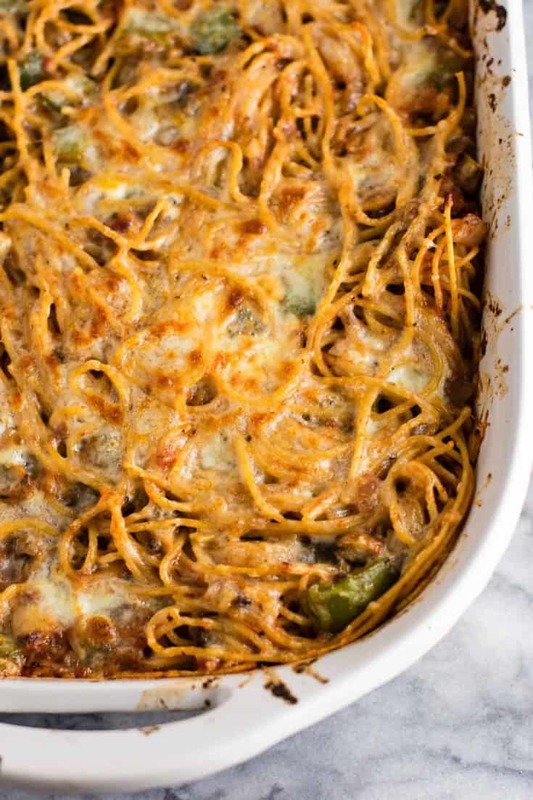 This one’s a guaranteed family pleaser, perfect for a quick weeknight dinner! 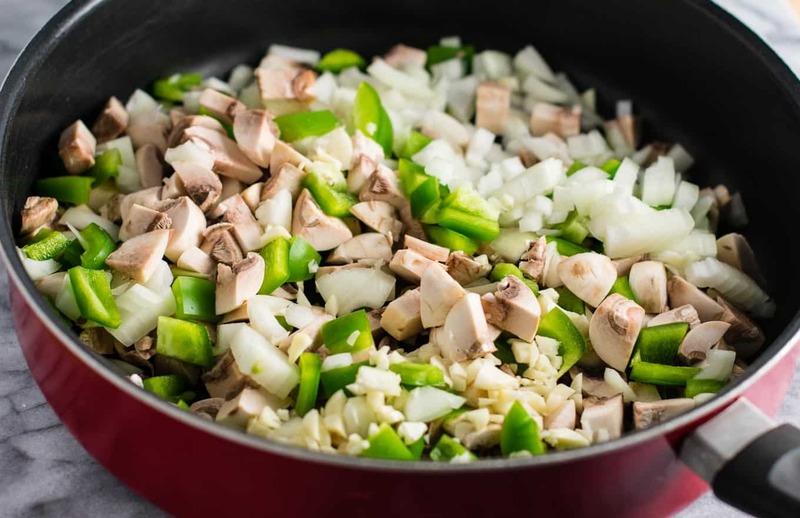 Combine onion, garlic, mushrooms, green pepper, olive oil, sea salt, pepper, basil and oregano in a large skillet. I love adding red pepper flakes for spiciness, if you do not like spicy things, simply omit from the recipe. This looks delicious, Joy. I was just writing how I am tired of the pasta I constantly make, and this seems like a smart way to change it up. 🙂 I just browsed through some posts on your blog, and it looks great. And congratulations on getting married! Your stories and pictures made me smile. How many cups would 16 ounces of diced mushrooms be? I’m not positive since I usually just purchase the containers of mushrooms premeasured. I would estimate around 4 cups of sliced fresh mushrooms! Ok. Thank you so much for your reply! Used poblano and mini peppers, and some half moon 1/4″ zucchini, Parmesan, mozzarella and cheddar. This baked beautifully in my new oven. Covered with foil after twenty minutes, it is perfect and moist. The foil was placed over some parchment paper on top of the dish about twenty minutes after removal from the oven. Thanks for this recipe. I made it and it was very delicious! So glad to hear you enjoyed it Teerna!